Congratulations Government of Maharashtra! You succeeded to achieve your target. This is what you want in Maharashtra? Three cheers to Ashok Chavan. All the security provided to protect Shahrukh Khan's My Name is khan with AK-47. Such chances was rare to terrorists to attack on very sensitive place like koregaon park. I know that area. 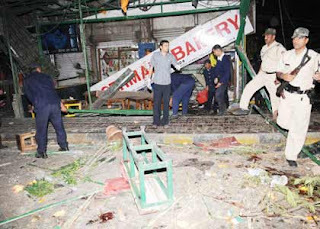 After the Mumbai attack on 26/11, Government must have to protect such area in Pune also. But who is more important than innocent people's life? Government of Maharashtra is all responsible for this. Was that really necessary to provide 20 thousand policemen to protect Rahul Gandhi? Beating Marathi people in Maharashtra was really a couregeous job to impress Rahul Gandhi? This is what I can now say after elections results. I dont want to waste my words to world. Now you can decide how badly we choose our Government. And my heartly request to my Punekar brothers, you have to make habit of these kind of things in Pune & Maharashtra. God bless piece to souls of all victims..